BEST FIGHTER FOR CANADA: Fighter Jet Fight Club: F-35 vs. Silent Eagle! Fighter Jet Fight Club: F-35 vs. Silent Eagle! In this week's edition of FJFC we look at a classic scenario pitting an up-and-coming star against a grizzled old veteran. The Lockheed-Martin F-35 is the new kid in town, looking to make a name for itself. A product of the Xbox generation, this kid played Call of Duty on a plasma screen, not Cops and Robbers in the backyard. While its being promoted as "the next big thing" in fighter aircraft, many remain unimpressed. Some say that it has only gotten this far due to "friends in high places" and a few greased palms. Unlike the new kid, many think the F-15 Eagle's best days are behind it. Despite many years as the reigning champion, it has been surpassed by another prizefighter, the F-22. This, despite the fact that the F-22's fights have all been fixed and real challengers ignored. Some even say that the F-22 has issues that make it impossible to work with. The F-15 has not been sitting idly by, however. The Boeing Bruiser keeps going to the gym and has learned new techniques. It has changed with the times and has managed to reinvent itself, not once, but twice. When times called for a heavyweight fighter-bomber to replace the F-111, the F-15 gulped down some raw eggs and beefed up to become the F-15E Strike Eagle. Now, with stealth all the rage, the F-15 has spent some time in the meat locker punching up sides of beef, still hungry for a fight. Now billed as the F-15SE Silent Eagle, is it ready to relive some of its previous glory? Everyone should know the rules by now. Everything works as advertised and costs don't really matter. In this corner... Hailing from Fort Worth, Texas, weighing in at 29,000 pounds (empty)... THE LIGHTNING KID! And in this corner... Hailing from Saint Louis, Missouri... Weighing in at 31,700 pounds (empty)... THE BOEING BRAWLER! Interdiction/Penetration: To put it simply, this will always be the F-35's category. It was made for this. It is very likely that the only platform to outscore it here would be the B-2. The F-22 may be stealthier, but its ground attack ability is quite limited. Against any other fighter, the Silent Eagle might come out on top here. It is said to be nearly as stealthy as the F-35 from the front (the angle most likely to be pointing at the enemy). From the sides, top, bottom, and rear... No so much. Being "almost" as stealthy as the F-35 from the front does not equal "as stealthy" as a F-35 all over. Deep Strike: Like the prizefighter who refuses to retire, the F-15SE has endurance. Even without external fuel tanks, the Silent Eagle's combat radius more than enough to get the job done in "stealth mode". 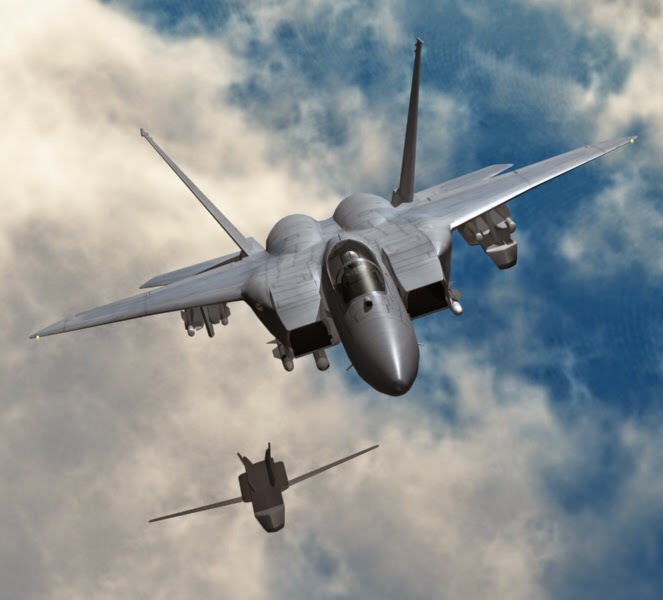 When that is not enough, the ability to add extra fuel by way of CFTs or external drop tanks make sure that the F-15SE can go the full twelve rounds. Lockheed-Martin marketing materials like to play up the F-35's range compared to fighters like the CF-18 and F-16. While this is certainly the case, fighters like the CF-18 and F-16 were always meant to be short range aircraft, acting alongside longer-legged fighters like the F-14 and F-15. When compared against newer fighters like the Typhoon, Rafale, and Super Hornet; the JSF's range is about average. What really hurts the F-35 here is the lack of any sort of external fuel carriage. Older style tanks were found to have "separation issues" (meaning they crash into the aircraft when released). A newer bowling pin shaped tank did little to solve the problem in wind tunnel tests. Payload: The F-35 can certainly punch well for its weight class. It can carry a respectable 18,000lbs worth of ordinance on 10 hardpoints. Each of its two internal weapon bays can carry up to a 2,000lb JDAM. If you need to fit a "bunker buster" into a medium size fighter, the JSF is just about your only option. The Silent Eagle is only able to carry a 1,000lb JDAM in each conformal weapon bay (CWB), so its sneak attack does not have the same authority as the F-35. When not being sneaky, the F-15SE can carry a 23,000lb barrage. When the JSF is done for the day, the Silent Eagle still has plenty of fight left. Close-air-support: The F-35 is slated to replace the A-10. A lot of people think this is not a good idea. 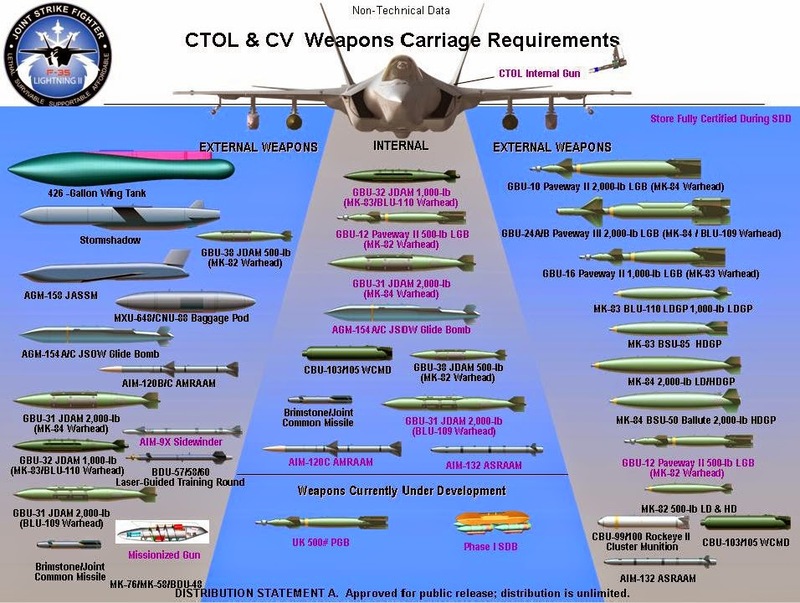 While the F-35 is equipped with precision targeting capability, most would agree it is not a very robust aircraft. In fact, in an effort to shave 11 pounds from the aircraft, the JSF is now quite vulnerable to ground fire. By contrast, the F-15 has been know to make it home literally on a single wing and prayer. Yeah... This one is no contest. Advantage: F-15SE, clear winner because it doesn't explode when shot with small arms fire. Air-to-ground winner: If being sneaky is what you need, than the F-35 really is the best thing going. If, however, you need to blow a lot of stuff up, really far away, while getting shot at yourself, the Silent Eagle is the way to go. Winner: F-15SE Silent Eagle. The F-15SE knows this trick. It has its own stealth treatments, especially on the front where it counts. While it may not be as stealthy, it makes up for it with a bigger AESA radar. 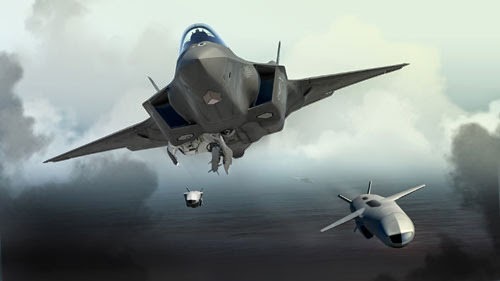 The F-35 will have an easier time finding the Silent Eagle, but it will have to sneak past the F-15SE radar and IRST in order to get a shot off, at which time it will more than likely give away its position. Beyond visual range: The F-15 has an undefeated streak of over 100 to nothing. Most of it coming from BVR knockouts. Time for the Lightning Kid's trainer to give it some advice: Throw in the towel while you still have a chance. The F-15SE flies substantially faster and higher. It carries the same amount of AMRAAMs internally as the F-35, but missiles launched with more energy (i.e. : faster and higher) have a much better probability of kill (pK). When not limited to internal storage, the F-15SE can carry enough AMRAAMs to fire off two at a time and still have plenty left over. Within Visual Range: The original F-15 was designed using the lessons learned over Vietnam. Those lessons came as the price of hubris, thinking that BVR AIM-7 Sparrow missile would render close-combat obsolete. Instead, it was found that BVR missiles missed far more often than they hit. Fast but clumsy fighters like the F-4 and F-105 were simply not as superior as they should have been to much cheaper MiG-17s and MiG-21s used by the North Vietnamese. As good as the F-15 is at BVR combat, it is still one of the best WVR fighters in the world. A massive power-to-weight ratio, low wing loading, and a fanatical devotion to John Boyd's energy-maneuverability theory clearly puts it above the F-35's timid performance. The JSF's fancy HMD and DAS systems may give it an edge against older fighters, but the F-15SE comes equipped with IRST and HMDs to even the score. Dogfight: The F-15 used to be an enforcer for the Fighter Mafia. It can take a beating as well as dish it out. Its bubble canopy gives the pilot an excellent view around the aircraft. Its M61 Vulcan 20mm cannon may be a little old fashioned next to the F-35's 25mm GAU-22, but it carries nearly three times the ammo. The F-35's hunchback design makes it difficult for the pilot to "check their six". While the fancy DAS and HMD give the pilot the ability to "look through" the aircraft, nothing quite beats the "Mark One Eyeball" in these situations. The fragile F-35 is already at a huge disadvantage against the bigger, faster, more agile F-15; things do not get better when it is fighting with the equivalent of an eye swollen shut. Versatility: The Silent Eagle does not pretend to be a "Jack-of-all-trades". It is a fighter, pure and simple. It is not going to do your taxes or write a sonnet. As I have noted before: It blows stuff up. If you want something else done, get a different plane. The F-35 may not be the best air-superiorty fighter, but it does at least attempt other missions. With its stealth, sensors and data-links, it is actually a pretty good reconnaissance aircraft. It is also available in different flavors: The CTOL F-35A, the STOVL F-35B, and the carrier-capable F-35C. Logistics: Older versions of the F-15 are already in use all over the world. It is not quite as common as the F-16, but with over 1,600 built, parts should be plentiful no matter where you go. The Eagle has a long life ahead of it as well, likely flying well into the 2040s. It does require a well equipped airbase and it does have a reputation for needing lots of attention. For those willing to commit, the F-15 does offer a long lifetime of faithful service, however. The F-35 sets out to replace all the F-16s and F/A-18s currently in service. Even conservative estimates put sales well over 3,000 worldwide... If everything goes as planned. While this should give the F-35 a clear advantage here, the JSF's history really puts this in doubt. Frequent groundings during development have made the F-35 a "no-show" at some events. Its stealthy coating has troubles peeling off, especially when it goes supersonic. For the first time here in FJFC, we have a decisive knock-out instead of a split decision. The Lightning Kid really never had a chance. The Boeing Brawler is simply a better strike fighter, being better at both striking and fighting. The JSF is definitely stealthier, and has some cool gadgets, but the Silent Eagle sticks to the fundamentals and it shows. The Boeing Brawler still has a long career ahead before it has to hang up its gloves. Got any color commentary? Please post it below! I'm keenly looking forward to Eurofighter verse F15 and Gripen verse F18. I think the S. Korean decision involved a little of both. They already use the F-15K Slam Eagle, a very recent aircraft. The chance to add a stealth capability was likely too good to pass up. LockMart has also partnered up with KAI to offer the T-50 Golden Eagle for the T-38 replacement. This could mean sales up to and possibly beyond 1,200 trainers. An attractive offer for sure. Korea is not replacing F-15 with F-35's. They are replacing F-5's and F-4's. The Korean F-15 will be flying for a long time. If the cost of purchase and operation are such a worry, Canada should consider a versatile fleet of 35 F-15SE Silent Eagles and 40 F/A-18E/F Advanced Super Hornets and 5 EA-18G Growlers. All should be outfitted with IRST, HMD, conformal tanks, the latest, most powerful radars available and an upgrade in thrust. Super Hornets can be used as a general workhorse, and the Silent Eagle can be deployed to challenge anything that comes close to Canadian airspace. Well also there greatest problem is right next door. South Korea is is different from most as they are on alert all the time. The someone stealth attack aircraft make sense and they only are picking up 40. So let me go backwards a bit. We all know that the F-35 should be called the A-35 and that this aircraft is to replace the A10 and the harrier. It is also to replace the F16 and F18 as well, but is it only to replace the attack aspects of these two aircraft? So the USAF should still requires some F-16's for air to air missions and air interception? I do not think the Eagles are needed. Super rhino is correct. The SH is enough for our needs, especially with Infrared system, weapon pod. If we get blown out of sky in the Arctic, NATO is coming. Go back to the days of interceptors and ground attack aircraft. F101 to F15's and F104 & F5 to Super Hornets. The F35 is an attach aircraft, not a multi-purpose fighter like the Super Hornet or F15 family. The A-35 must work in combination with other aircraft and if you don't have this capability then this is not the aircraft with you. Unless you say that during campaigns that Canada will be only used for attack missions ( if it has the A35) and that the sovereignty of Canada will be protected by the USAF. I suggested the F-15SE for its superlative performance envelope (acceleration, range, radar class similar to F-22, BVR engagement energy). In terms of top speed, NOTHING is faster than the F-15, not the Su-35, not the F-22 (although F-22 can supercruise). The Super Hornet has lousy acceleration and cannot perform interception roles like the F-15. To fix this, we must get the Advanced Super Hornet variant with GE's F414 EPE (Enhanced Performance Engine), which can boost max. thrust from 22,000 Ibs. to 26,400 Ibs. During the development of the F-16, the Fighter Mafia's Boyd and Sprey argued over what range it should have, Sprey was (and still is) the purist. Very black and white. You either do it 100% or don't bother. He wanted less fuel, more performance, Boyd being the great 'chess player' saw that the Air Force were going to try and kill the Falcon because in their mind it was small, so that meant that it would have no range (wrong!). It would only be good for taking off and defending its own airfield ie. "an airshow plane". Boyd persuaded Sprey to change on this point so the end result was not only was the F-16 half the size, half the cost, and a better dogfighter....it would even have a greater range!! Boyd (again, the great chess player) deliberately kept the range of the Falcon quite. Long story short, when Boyd finally revealed the data, Air Force personal were in shock and when they turned to Boyd and remarked, "I thought this was going to be short leg aeroplane?" Boyd replied "it is - just not as short legged as the F-15". What makes the F-15's 'win' against the F-35 even more impressive is that this comparison assumes 100% no faults, everything works and ignores cost - good piece of kit the F-15. Doug a minor comment about your comment about the F-22 and that is that the F-22 can only talk to itself and that is the reason it is not used in for instance Libya. Listen on the podcast 3 July 2014: The F-35 Goes International at http://aviationweek.com/podcast there is no time scale present but half into the podcast they start to talk about the issue about half into the podcast and more at the end it is revealed about Libya. Super cruise is very important. F22/Typhoon/Rafale/Gripen can do it. Is super cruise only important if you don't have a ton of refueling tankers is the air as the US does? I thought the there were no F22's in Lybia because they are too expensive to loose one. Sorry, was not clear. SE eagle performance has already been ignored by Canada. I would pick ASH because of Growler commonality. SH is already past. Super cruise is not only about getting somewhere fast (or running away). The weapons from a super cruising fighter will travel further and faster and are thus deadlier. Just to add one point not considered in the analisys.The Stealth advanced Super Hornet with its reinforced landing gear and big fligh controls can take off and landing in very short airfields in the windy and icy North, this is a condition that the F-35A and Silent Eagle don't have. Also they don;t have electronic attack capability. F-35 is just the totally wrong version of the Advanced Super Hornet and the Silent Eagle is a 20% faster, more expensive and less stealthy version of the Advanced Super Hornet with 20%more powerfull engines. The super hornet uses the same engines as the Gripen, so with a bit of work you would think that the SH could have this feature. Maybe it is time for Doug to introduce a Troll warning? As this thread is about F-35 and E-15SE and not any existing or possible future versions of the Hornet family it is ok to only handle the included aircrafts otherwise there also exists other aircraft that could be considered with/against the Hornets so to say. Use your Troll magic card for yourself. I'm not the first one who mentioned the Advanced Super Hornet in this topic. Not really a surprise when you compare the F-15SE vs the F-35A. For all the discussion about the op cost for the F-15SE it looks like a cheap date compared to the F-35A. While the 15SE may have minimal stealth it brings so many other capabilities to the table. The question I want to ask is when will someone try to integrate more "Growler like" features into the 15 platform much like the ASH F-18 "hybrid" approach. That's when I think things get really interesting for the 15 platform future. If you're going to throw Russian fighters like SU-35 into the mix, then the MiG-31 is much much faster than the F-15. It's not only about engines. Gripen has very good aerodynamics and extremely low drag. The F18 on the other hand has a lot of drag (air resistance). This is why the Gripen C has such good performance despite a comparatively low thrust to weight. High drag is one of the reasons I'm not a huge fan of the F18 or the F35. In my opinion aircraft should be slender and "sail well". Like the Spitfire. Let's try and keep discussion focused on the Silent Eagle and F-35. Better to compare the advanced Super Hornet/Growler with the F-35,Typhoon Rafale or Silent Eagle. MIG is a pure interceptor that the Russian are going to replace. That's not true. Similar to the F-15 which also started out as a "not a pound for air to ground" interceptor, the MiG-31 has evolved to become multi-role. I find it disappointing that there is nothing in the news about the government considering F-15SE or F-15E as a competitive choice for Canada. It has everything: the speed, the sensors and the range to protect our vast territory. Do you want to try to intercept or chase something with an F-35? Will you get there in time? If you get hit by something big like a missile (not a bird), which plane is going to give you some chance to limp the aircraft back to base? Boeing's best bid should include modifications such as F110-132 engines rated at 32500 Ibs thrust, rugged landing gear, APG-82 radar, the best IRST available, HMD, switchable conformal tanks and weapon bays. Love the F15 as an aircraft, a pure predator when outfitted properly. However, I would agree with you and SuperRhino. The latest ASH F-18 especially if it's up-engined with EPEs is more than enough plane for the RCAF. I was just responding to fighter jack comment about mixed fleet and SE being the big dog. The F-15SE if outfitted with 132 engines and the other systems you mentioned would be a absolute beast of an aircraft. Probably to much aircraft for the the RCAF, at least with their current mentality. Operating out of Cold lake or Bagotville would not be an issue, but deployment to small air fields and frozen ones could be. The only scenario I see Canada operating 15's in, is a hi/lo where 80% of the aircraft are not 15's. Does anyone know if the F-15SE with conformal weapons add-ons can super-cruise? The F-15's shape is optimized for transonic performance. I think it would take nothing less than re-engine to make it "officially" supercruise. Unofficially... I'm sure it can already. Their seems to be some disparity over what "supercruise" actually means. Most think it simply means mach 1+ without afterburners. Others (like LockMart) think it should mean M1.4+, since this rules out everything except the F-22. I know what you mean. The F-15E is my favorite aircraft. But we passed on it. This F-35 smells of politics, bad politics. GE has designed the F110-132 to be installed into the F-16E/F or F-15E and its variants. The big question is if installed on the F-15, will it generate 32,000 Ibs. of thrust with no modifications to air intakes? The F-15 cruises at 570 mph or less for endurance. Punching it to supercruise (1.0 to 1.4) would need clean configuration at 32,000 feet or more (no weapons on wing stations) but with conformal modules installed. It could do this on high levels of dry thrust but it's a bit hard on the engines (regardless of what engine is installed) and you need a good set of engines before entering a fight. Waiting for further technological improvements for engine durability would be preferable. It would not be "too much aircraft" when there is global destabilization, vast territory to defend and challenges to arctic sovereignty. With renewed Russian aggression, Canada needs a large, intimidating fighter jet brimming with sensors, weapons, with no performance compromises. It already costs less than the F-35 to buy and operate. If costs (compared to even smaller, cheaper fighters) are dominating the media, then what is the cost of another country successfully laying claim to our territory or our waters. It would be humiliating. BTW, when are we going to see the Rhino go head-to-head with the Silent Eagle!? I do not think it's too much aircraft either Fighter Jack. But clearly those running the RCAF and the politicos likely do. It's small time thinking if you ask me. Canada as a 1st world country, rich in resources and industry with a large land mass, 3 ocean fronts, should actually find it easy to justify a F-15 type aircraft. Obviously not every RCAF plane could be an F-15 type but certainly some can be for the purposes of interception and even deep strike. I do not think Canada is interested, or, ever was interested, in a true interceptor. We found an affordable aircraft that allowed us to meet our NATO obligations, slap 3 drop tanks, and say hello to Bears.